On the ninth full moon of 2018 it was time for a little adventure; the Slow28. A superslow journey around one of the Dutch islands and one of the last real wild places in the Netherlands. 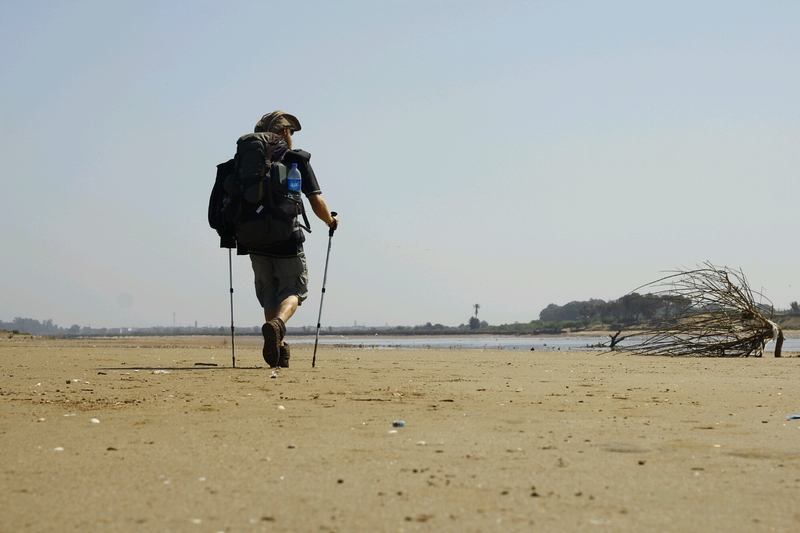 I walked for 30 consecutive hours straight, covering 30 kilometers, hoping to find the 28 beach poles, guarding the island for the last 150 years. It was an interesting journey through the darkest place in the Netherlands. Follow me on Facebook as well! Last few months I spent on the Dutch Island of Schiermonnikoog. Being an adventurer is not always easy, who is going to pay you to go on a journey? That’s right, me. That’s why I had to find a job and a job was found as a bicyclerenter on this beautiful island. So after working here for four months I’ll end this periode with a good ‘ol adventure. The SLOW28. Most journeys go quite fast for me. I try to do as many kilometers as possible, and try to go from A to B as fast as possible to challenge myself and my mind. Because of this I miss what is really around me and all the details of the land I’m walking, cycling or crawling. I decided to do things a little different this time (it also helps this island is quite small). So let me tell you about this very special island. Schiermonnikoog is one of the five Dutch islands. It is the one with the least amount of people living on it; 947. Most part of the island is national park, part of UNESCO world heritage. Only the village has inhabitants and there are no people living outside the main village. Outside the village one can find a mixture of dunes, forest, beach (the most wide beach in Europe), wetlands and a huge mudflat when it’s low tide. Birds, seals and many types of insects and flowers thrive here. The landscape is ever changing. Winds, water and sand make the dunes bigger and smaller every year, the beaches wider and the ground more boggy or hard. 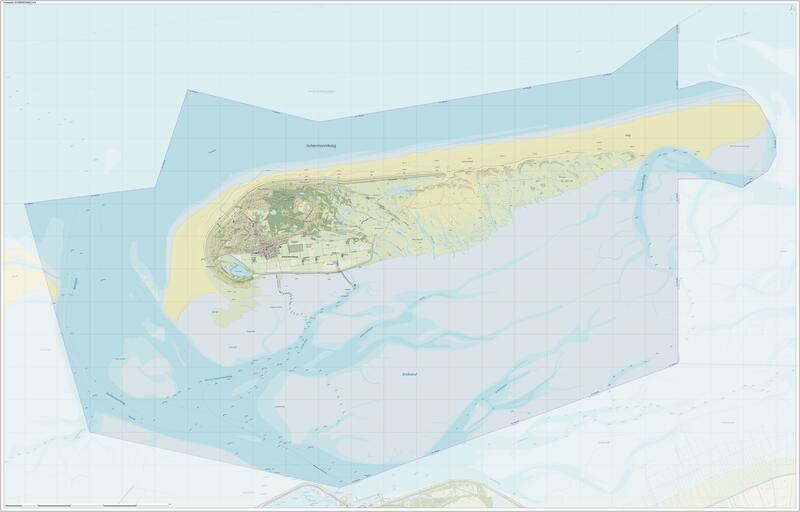 To keep track of these changes the Dutch nature administration placed “beachpoles”. At every kilometer a pole was placed. The poles would be 5 meters high, and if a pole would be smaller then last year it meant the sand got higher. With new technologies the poles became obsolete, but they still remind us of the ever changing island and nature that we are a part of. In total there were 288 poles placed. 28 main poles around the island, each one kilometer apart and the rest for extra measurements. This year it has been exactly 150 years ago the first pole was placed. On September 25th (full moon), I will walk all these poles. At 11 AM I’ll start at pole one and walk towards the second, taking one hour for a kilometer. During this hour I’ll make pictures and write down in 150 words what I see. This journey will take 28 hours in total; from 11 AM till 3 AM. During this journey I will walk the widest beach in Europe, walk through dunes and through swamp lands. In the night I will walk the “Kwelders”, a boggy and soggy land with only small plants and nothing else. On the kwelders I will cross small salt water rivers, bringing salt water into the land when the tides are high. The last kilometers I will walk on the sea floor. During low tide the sea on the south part of the island gets dry, and it becomes a mudflat. In fact, during this low tide one can walk all the way to the main land. Schiermonnikoog is still one of the wild places in the Netherlands. Unbroken sea winds shape the island, as well as the salt water and sand. Nature makes it’s own land and shapes here, making it one of the most beautiful and rugged places of the Netherlands. This journey takes me to the last wild place in this well shaped country and walking 28 hours straight on a slow pace allows me to see every detail of this land. I hope the moon will help me to light up the night. The most awesome job you can have is to be an adventurer; roaming the corners of the earth, being a dirtbag with your bike in Russia or walking a dried up river in Morocco. Have a look on my Facebook page, it’s full with pictures of me traveling in great places or even just next door. This is what I decide to show you. These are just fragments of what my life as an Creative Adventurer is. It’s around 5%. In this piece I’ll show the other 95%. This piece is just an interpretation of my job as an adventurer and suits to me, other adventurers may have way different experiences. Lets start at the beginning, in 2013 I bought a bicycle and cycled 900 kilometers through Sweden and loved it. A year later I rode from Budapest to Scheemda (NL) for a school project. I never heard of adventurers and didn’t know it was a thing. I just wanted to do a cool schoolproject. The film I made about it was received quite well and before I knew it I wrote a guest blog for Tom Allen and got myself a night where I could show the film. People I didn’t knew showed up and I felt the flow was good on this project. It was part of my education studying popculture and during the education I felt like a struggling artist, but then without being the artist. Then suddenly there was this flow of an adventurous project and I could see how I could combine being an artist with traveling. The concept of a “Creative Adventurer” was born. When I decided to spend all of my time on adventurous travel I started many projects. The Leeuwarder Adventure Night where other people gave lectures about their journeys; I joined (and now am captain of) Zwerflust, a travel collective where we give lectures on schools (and sometimes festivals) teaching youngsters the art of travel. Also filmfestivals came on my way. After sending my first film to the International Cycling Film Festival I got invited to the event in Germany and the year after I hosted a screening of the ICFF in my hometown. Soon I was asked to program a night before the ICFF in Germany and the Rough Conditions Adventure Film Festival saw the light. In between I kept on making little and bigger journeys, writing about them on my blog and sometimes for magazines (mostly for free). It was a lot of work, and hardly any money came in. A hundred here and there, enough to get a tent. Or maybe a new lens for my camera. Definitely not enough to pay the rent or let alone food for a month. Although it sounds really awesome to go on a (mini)tour with my own adventure film festival, truth is I’ve been sending emails for weeks and weeks to cinema’s to be mostly rejected. The tour I’m doing currently is in three cinema’s. The cinema I work in myself in Groningen, the cinema in the WORM in Rotterdam where I did my internship and another cinema in Enschede where I actually have to pay to rent a room and get money back from the tickets. The same goes for magazines. After a journey I write to 10 magazines from witch 7 reply. From these 7 two are interested. One can’t pay, the other one does. I do them both, because even while I think my work deserves money, I love it as well. I do it because of the love for writing. I loved writing so much I made a little booklet of one of my journeys. In the end I made 100 copies and tried to sell them for 5 Euro’s a piece. About 20 were sold and I gave away 40 by now. In my head 100 copies would be too less of course, because everybody would buy them! Sadly this was not the case, but they are great gifts. Most of the work for contacting magazines, cinema’s, organizing adventure nights and writing is behind my laptop. It’s home is an office with 3 other designers mostly drawing or working on a laptop as well. We all get our “screen-tan” on when the sun is shining outside. But maybe then I could work harder? I could work Saturdays and Sundays as well. Start at 8 in the morning and finish at 10 in the evening. Sometimes I do this but most of the times I need to get away. Socialize with my friends, sport, go to concerts, check out some art, cook, or do absolutely nothing and just sit in the sun. I don’t want to get a burn-out as many other 30-somethings got. It all sounds quite negative and you might ask yourself: What’s the whole point of doing this? I think the pro’s are outlaying the con’s for this one. All the journeys I’ve made are challenging. Mentally and physical so from every journey I learn about myself and therefore grow as a person. It also allows me to see other cultures in a special way; being invited for cuban cigars in Russia, or meeting an old farmer lady telling about a ghosthorse she has seen in Scotland. These journeys are my creative outlet and because of this I look at the world with a childlike eye. I see the world as a huge playground for awesome adventurous projects. And I am the one making these projects; everything I do myself. When I mess up it is my fault, when I do well it’s all because how I do and the choices I make. This gives me a huge feeling of accomplishment even when I fail. Because I work for myself I notice it when I work harder and do my best. Another thing is the sportive aspect, when I travel I hardly drink. Not that I’m a raging alcoholic but still I’d like to get my beers on. I’m outside most of the time with fresh air filling my lungs and sun or rain on my skin. I feel more alive when I travel and feel a long forgotten fire burn up inside me. I leave everything behind for a little while and focus on the here and the now. It feels like I push a reset button from my life and society. I can look back at what I did so far and come back with new ideas, visions and projects. The adventure flow is still there, I feel it. Sometimes it’s a little hidden but every project it comes up. I don’t know if I’ll still be doing this in 10 years but I really hope so. The most important is keep on going, keep following the flow, making journeys, inspiring people and take time off now and then. Because life is way to short not to try, right? Check out my Facebook page as well for these events! Film en avontuur; twee handen op een buik. Film is een perfecte manier om een avontuurlijke reis op een rauwe manier weer te geven. Er zijn geen filters, geen special effects en echte emoties. Tuurlijk, je kan beelden van een film zo verknippen dat er een ander verhaal uit komt, maar dit kan ook ten goede komen. Een reis kan zo een poetisch prachtstuk worden waar de kijker meegenomen wordt naar het land, de situaties en bijna op de schouders wordt genomen naarmate de kilometers volgen. Tijdens mijn opleiding aan de Academie voor Popcultuur ben ik veel bezig geweest met het maken van films en uiteindelijk ook met filmische weergaven van mijn reizen. Reizen en film is voor mij verbonden als bananen en fruitvliegjes. Of als een backpack en een avontuur. Daarom heb ik in 2015 ja gezegd tegen de vraag of ik een programma voor het ICFF in elkaar wilde knutselen. Dit programma is het Rough Conditions Adventure Film Festival geworden; een film festival over avontuurlijke reizen die voor iedereen zijn weggelegd en niet alleen voor atleten of extreme sporters. Om de boodschap van avontuurlijk reizen de wereld in te brengen en het publiek te inspireren de platgereden paden voor gezien te houden en het onbekende in te trekken ga ik ook op reis met het film festival. In Nederland doe ik drie steden aan; Rotterdam, Enschede en Groningen. Hieronder kun je de data en evenementen zien. Wil je geïnspireerd worden en de tofste reisfilms zien? Kom dan naar een van de edities van het RCAFF! With the click of the camera a beautiful sunset is photographed. Now two things can happen. Or the beauty of the sunset is captured magnificently; vibrant colors, a little lens flare to make the picture feel alive and of course the most stunning view from the top of a mountain. Or on the other side, the picture just can’t seem to capture the beauty and vibe of the moment. They say a picture is worth more then 1000 words. So let me write you a story of 1001 words to paint a beautiful picture of a 10 second scene in your mind. My hands are still freezing from the wet, damp night. The nearby river roars wild while I stir in the blackened pot, mashing red goo with my aluminum spork. Dark green trees are surrounding us, some of their leaves turning brown to predict the coming of autumn. The second night was hard for me. Marin felt quite good when she woke up after the long night; maybe she got used to the emptiness in her stomach easier then me. Maybe her mind was more relaxed. Maybe I was getting sick. Normally I don’t get cold in my sleeping bag, but this night was different. I was so hungry I couldn’t fall asleep and the light of the morning didn’t bring the warm layer it normally brings. Finally I got up and out of my little green tent. I crossed the river over the crackling wooden bridge and went over to Marin. She was already making our breakfast of gathered autumn fruits. Apples, elderberries and sorrel leaves made our breakfast; we only ate from nature this three days. Filled with anticipation I stir the red apple soup. It’s getting thick and that is exactly what we need to get warm. With all my jackets on I try to keep the little warmt that my body produces close to me. It doesn’t help. There is no fuel to let the engine roar, Marin her engine runs on fumes as well. Heat is radiating from the cookingpot and I feel how my right hand absorbs the warmth. With the prospect of this warm sludge in my stomach the world looks a little brighter. I see sunrays fall over the treetops and hear a bird singing his early morning song over the constant sound of a roaring river. Is our breakfast ready yet? Are the apples mushy enough? Should it all cook a little longer? Whatever. Ready. Breakfast is served. With grace (I try not to look like a hungry savage) I scoop a spoon full of mushy apple and elderberry and direct it towards my mouth. As a child I’ve learnt not to eat boiling things. I need to have patience. The smell of warm food enters my nostrils; sour apples from a tree we found in a garden the evening before. Freshly picked 12 hours ago but not ready to eat yet. Made our faces twitch with every little bite we took from them earlier. The smell of the elderberries; a little godsend we discovered next to a farmersfield. The first bite of our little hot brew is magnificent. I close my eyes and let all sensations tingle through my body. The heat, the sour taste and the structure. But best of all, our energy we put in it. We have been hiking for two days now, only eating what we can forage. When we started we rode on the tail of a howling storm. It took us some planning to get together for this trip and a triviality like a howling, blasting storm wouldn’t stop us from making this journey. This storm was the transition between summer and autumn. The days were growing shorter as the temperatures droped little by little every day and fruit became scarce. This also was our problem; we were in between seasons. The summerfruits were gone or overripe and the nuts of autumn where not ripe yet. We relied on tiny apples we found in gardens on the edge of villages. There we hunted for edibles. Parsley growing from a flowerbox next to a restaurant. Flowers hanging from a low roof. Grapes from a monastery. Outside the villages we found overly ripe blackberries. We eat them by the hand full but they give us just a little taste in our mouths. Now and then we come across edible mushrooms we both know. Others we leave in the ground. The green and pink Springbalm is my favorite. Colorful, funny and tasty. I swallow the warm breakfast and with my eyes closed I feel how the cold nights and tail of the storm is being washed away by the hot food. It’s like an explosion in my stomach where the heat spreads to my whole body. All of a sudden I feel muscles relax in my face while the corners of my mouth go up. A smile appears on my face. A smile brought by hot food in cold times. In stormy times. It was the first official autumn storm and we were out, walking and gathering our foods. Gray weather and wind was upon us that early morning when we took our first steps on the “Eifelsteig” trail. The next 48 hours we would endure heavy rains, damp nights and a constant blowing wind. It was easy to bail out and go to a hotel, bed and breakfast or see if we could couchsurf somewhere. This weather adds to the adventure. It’s easier to stay warm when the sun is franticly shining and we would need less calories. But now our clothes were wet, the ground was wet and water was pouring from the sky at times. It made the journey speak more for itself; if we could keep a positive mental attitude in these conditions, we could also have this when the sun would be warming us and everything around us. On our very last day the sun was shining and we even had a little sunshine nap next to a busy road. When I open my eyes I feel like I’ve been reborn; waves of warm energy are flowing through my body. The ignition of my mind has been fired up. I can think again and I can see clearly, now the mist has gone. I feel alive. Just one little spoon full of warm, foraged food can do so much. I look Marin in her eyes: “care for a bite?” I ask her. She scoops up from the blackened pot, takes a bite and closes her eyes. I know what she is going through now. This scene happened during our Taste the Trail project. Here you can read about it and here is part 2. Zwerflust roughly translates to “Wanderlust”. A thing we can all relate to. We have the lust to wander on our own ways. We get inspired through TV, radio and even more on social media; #traveltheworld. But what is better then to hear it from the adventurers themselves? Zwerflust is a collective of adventurers, travelers and free spirits sharing their passion for travel and inspiring youngsters to travel in a sustainable and alternative way. After traveling through Australia and New-Zealand Isa decided to start Zwerflust. A collective of travelers sharing their experiences to inspire others to travel. After a few brainstorm sessions we decided we wanted to teach youngsters and young adults how to travel in a responsible way. Next to this we would share our experience on certain festivals. After a year of zwerflust it became quiet. Still a feeling of the purpose of Zwerflust haunted me. Zwerflust has a huge potential to show youngsters how travel is possible. How do you go from the idea to work on a farm in New Zealand to having the spade in your hands and helping the farmer dig an irrigation trench? Or you want to travel, but you don’t want to fly. Is it possible to take a bicycle to the other side of your country? Or even your continent? And isn’t the world a scary place? On our screens we see murder, war and violence. From our experiences we can tell most parts of the world are good places. By showing youngsters they don’t have to be afraid of other cultures or countries, they will open up more and we end up with a more open minded and travelled generation. Because of this potential I decided to kickstart the concept of Zwerflust again. The mating call of Zwerflust on social media attracted a small but various group of people. Arjen who walked from Alkmaar to New York, Joost who circumnavigated Sumatra with a kayak, Monique who uses walking as a form of art or Fiona who backpacked many, many countries. More people will join the project and together we can inspire people on a young age to travel the world, learn, work together with other communities and become true “World citizen”. Soon we will start hitting up schools, festivals and all sorts of places where we can share our travel experiences. Are you a teacher on a Dutch school and do you think: “Hey, I can use a couple of experienced travelers teaching my pupils”, get in touch and we can figure something out! Because I’m a filmmaker, film festival organizer and random film lover, many films pass my eyes. Some are great, some are crappy but every film is made by somebody who loves to share their experience of adventure. Sometimes this can lead to films that haunt you and inspire you to make the best of your life. I made a list of five of the best short adventure films I came across during the years. (Forest Woodward/Gnarly Bay, 2015, 9″) When we become older we see how we start to look more like our parents. We see we get older as well, and how the choices we made in past years influence us. When Forest found a poem his father wrote him after his birth, he decides it’s time to step into the time machine. He takes is 70 year old father down the Colorado river to let him relive his youth. A beautiful and breathtaking film, showing we are never too old to go on an adventure. Goosebumps assured. In this film climber and adventurer Kyle Dempster starts out naked at seven in the morning. We probably ask ourselves: Why is he up so early? Well, he is crossing a river in Kyrgystan; the Alps of the Central Asia. This adventure brings Kyle to the most inhabited places in the country, cycling to blank points on the map. After getting lost, almost being swept away by a monstrous river and getting up so early he finds unclimbed peaks to make first ascents. Kyle is a great character to follow on this journey. He is a genuine adventurer and goes for the real deal, having the camera as his diary. Sadly in 2016 Kyle went to the mountains of Pakistan to never return. This film now serves as a beautiful hommage to a real adventurer. (Ian Finch, 2015, 5″) The Outer Hebrides are Britain’s far flung north-west frontier, an archipelago stretching over 120 miles north to south, thirty to sixty miles off the coast of Scotland. Islands of myth and mystery, of mists and dazzling sunsets across sparkling blue seas, of gentle machair and rugged mountains, home of the Gaelic speaking crofting people. The Beautiful music matches perfectly with the images shot by Ian himself, making this short film a dream of adventure. (Stept/Max Lowe/The North Face, 2017, 8″) Adventure Not War is the story of three U.S. veterans traveling back into the mountains of Iraq on a mission to heal wounds and experience the country and its culture without the shadow of war. Without the war they can finally meet the real people of Afghanistan. This beautiful story makes an unknown soldier to a real person. And shows what war can do to a person as well as adventure. (Zenga Bros, 2015, 11″) The Zenga Bros are exploring creativity, society and mainstream media. They have their own idea about this; “Be yourself, but only weirder.” Through Tall bikes they express their feelings towards society. A truly creative family showing life can be lived outside the box and this is way more fun then a “normal” life. Not an adventure film in the traditional sense of the word but in a way of living. Take your television, drag it behind your bike and go explore the boundaries of creativity! Do you know some great adventure films as well? Let me know in the comments or on Facebook! I’m lost. The only thing I see are thorn bushes for kilometers on end. In the distance the long shape of a mosque, an indication that i’m not too far away from society. But nothing more. I look at the sun but can’t make anything of that. How can I lose track of the river? Sometimes an adventurous journey is a real adventure. Sometimes nothing happens. We tend to forget this; the long kilometers of black asphalt, cars passing by, the dredge only broken by a honking horn or a passing donkey packed with weeds. A day where actually nothing happens, until something happens. Because on an adventure the little things are the most important. The long asphalt stretches it’s black tongue in front of me, mostly I don’t even see the end. I know it’s just 20 kilometers more. A walk of four hours, but I calculate six. At these moments my mind wanders, it wanders from left to right, from the tip of the iceberg all the way to the bottom of the ocean. Good ideas come up, stupid jokes that make me grin and past experiences with friends or family. As the ticking of my walking sticks indicates the ticking of the clock and the passing of kilometers the sun flies more towards the west. I hit the end of the road and put up my tent at an orange orchard. The voice from the mosque tells me it’s time for an evening prayer. Time for dinner. During the night my phone bleeps and indicates it’s empty. For the next day I apparently don’t have a GPS, but I’ve made a drawing from the map; this way I should be able to find my way to the base of the Souss river, the Barrange du Souss. I have found my way before with my own maps, but it seems my “map drawing skills” were a little out of date. The map is simple; I just have to follow the river, pass a bigger road, follow a little more river and then hit the road towards the Barrage. 20 maybe 30 kilometers, I could make it! 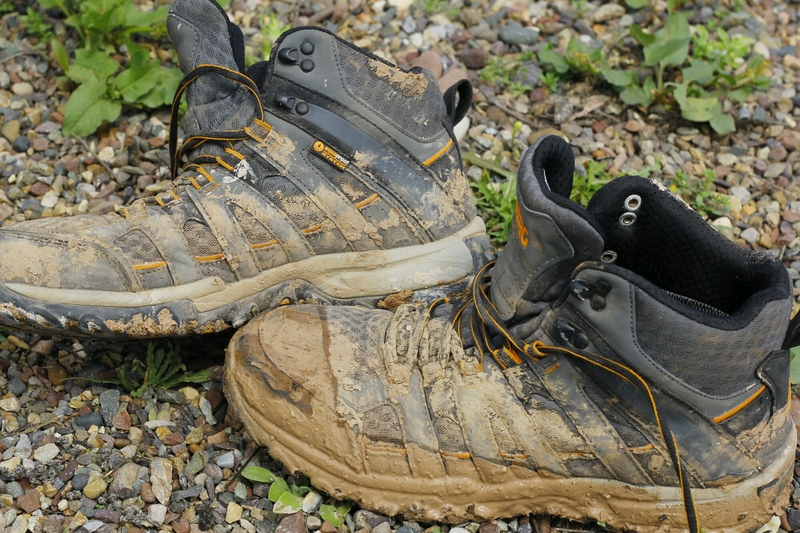 After walking in the base of the river for an hour or two I decide to go for the edge. The boulders and the sand in the river make the going too slow. After an hour I have no more clue where the edge ends and the Moroccon wasteland begins. Thorn bushes everywhere and no shade to hide from the scorching sun. I can see for kilometers on end. There is nothing. Only bushes, sand, boulders and the occasional crossing turtle, who asked what i’m doing there. I know when we are lost we have the tendency to walk in circles, so I look for a higher point in front of me and just walk that way. When I stop i feel my head getting dizzy. I have to keep going. Finally I find a cactus with a little shade. It might not be such a good idea to lay under it, but it’s the only shade I find. Finally I find my old friend the river again, I’m happy to see him. I recharge my phone at a little store in a village and go on my way towards the last kilometers. When I see the first streams water in little rivers next to the path I know I’m getting close. I follow the flow and see how the sides of the river get more and more green. Lush vegitation instead of dried up clay. 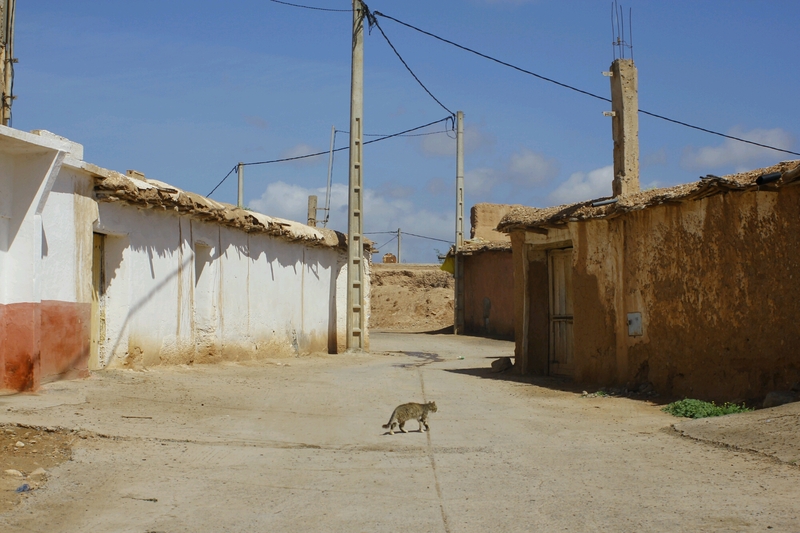 I walk through nameless villages until I reach the town of Oulouz. Here I treat myself for a tea with a big omelette. The locals in the store are fascinated by my story, and I’m fascinated by theirs. We exchange experiences, smiles and end up talking about soccer. Barcelona or Real Madrid? I get the omelette and tea for free. Just a little sign of Moroccan hospitality. Im going uphill towards the Barrage, and when I finally reach it I’m happy but tired. I sit down and enjoy the view and strong winds blowing shapes into the water. I’ve made it; I nearly walked the entire length of the Souss river. Except for the 14 kilometers I hitchhiked towards Taroudant my feet took me all the way from Agadir to Aoulouz and the Barrage. I think of all the people I met; the lonely young sheepherder who stalked me for most of the trip with weird whatsapp messages, the girl who wanted to be an English teacher and her father who owned a little store giving her an opportunity to go to school. The countless women who were hidden inside the houses but made me tea. They have not seen my smile their tea gave me. The farmer who gave me two kilo’s of oranges or the little kid who wanted to throw a rock towards me because I didn’t give him money. The shared laughs, countless hands and all the types of beautiful handshakes I’ve came across. And the countless sardines I’ve eaten. Maybe next month will be a sardine-less month. You can follow me too on my Facebook page! 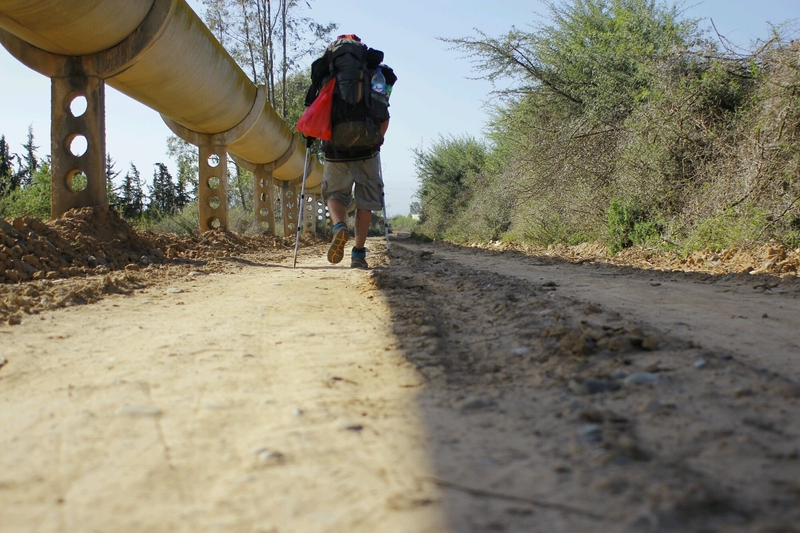 I’m walking the full lenght of the Souss river in Morocco in search of real Moroccan life outside the cities. So far I’ve encountered friendly sheepherders in long jalabas, vans packed with people and many, many orangetrees. The sun is blasting on my dry skin. My lips are dry, the air is dry and the river is dry. Although many signs I come across in the river tell a quite different story. After an hour walking over the boulders that is the Souss river I stop at a little shop where they sell all the moroccan nessecities; sardines, sweets, soda and bread. In this little place I learn the cold hard truth, seeing the evidence on a phone. A week ago water was flowing through this dry and dusty river with the power of 1000 horses. The blisters under my feet are getting a little better and since I’m not too good in sitting around it’s time to get on with it. This river doesn’t walk itself. I decide to have an easy day to let my feet get used to walking; 8 kilometers. 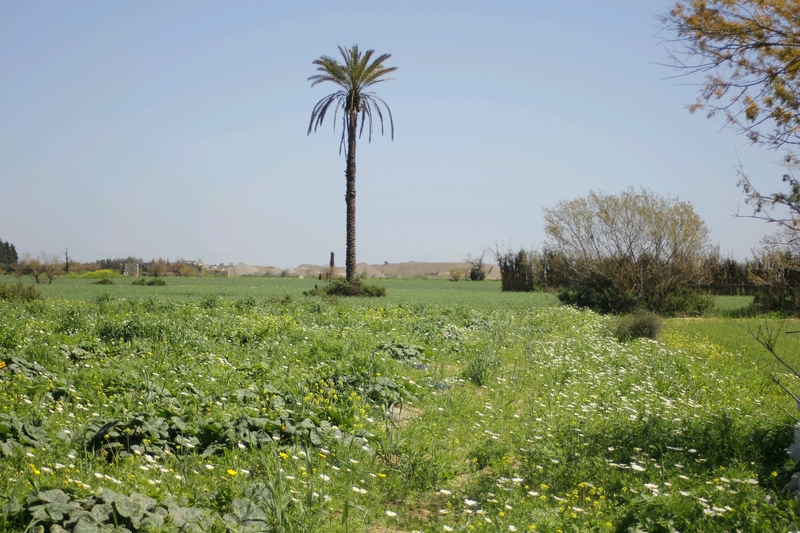 After an uneasy start I find myself on the brink of the city and on a pathway leading to the Souss. The plan was to walk the river, but past days I mostly was finding roads close to it and I saw the river once a day. Now I’m walking through it. The river is made up of boulders, sand and clay. The first day after Taroudant, where I took a hotel room, is just 8 kilometers but it takes some hours. I decide to camp on the edge of an island, where apparently is a graveyard for cattle. There are a couple of “islands” in the river, they are used for orchards or grazing for cattle. These “islands” are quite long (five to seven kilometer) and about one and a half meter higher then the riverbed. While I set up my tent a drizzle comes in. The only rain I would see for many days. Next morning I leave to an early morning sun to make some decent kilometers. After the rain from last evening a fresh blanket hangs over the riverbed. The little pollen of grass I find still wears drops of dew before they evaporate in the hot sun. The wind is strong and I’m struggling to find good spots to walk on. The best is the dried up clay. This is hard and solid. The worst are boulders or loose sand. And I have to admit most of the river are boulders and loose sand. After four hours I check how many kilometers I’ve done. Little over eight… This means two kilometers an hour! This is just a little faster as an sloth. I keep on zig-zagging through the river, searching for good ground to walk on when the wind picks up. 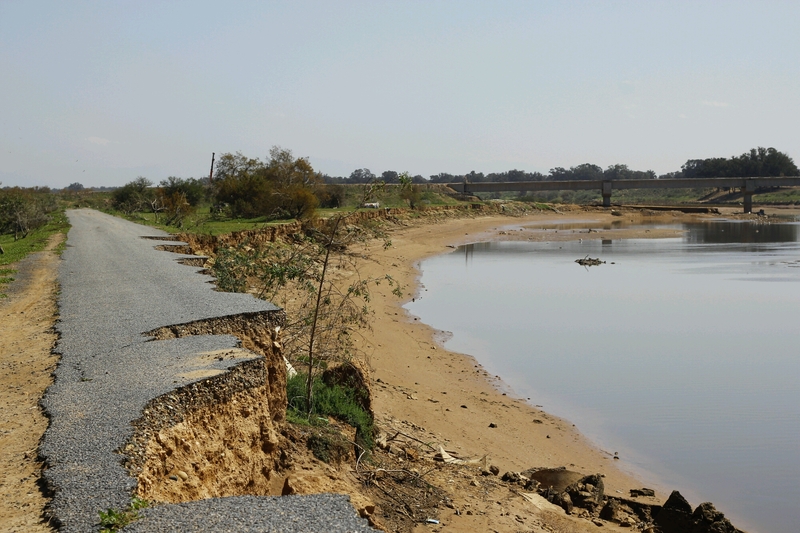 The wind gets stronger and stronger while more and more sand leaves the bottom of the river to take to the sky. I’m finding myself walking through a sandstorm, while in the middle of a river. I never expected to end up in a sandstorm. The winds are now so strong I sometimes lose sight of the sides of the river as well as the front. During the day I see many little improvised shacks in the river. As well as a waterway, this river is a source of rocks used elsewhere. People work in this river and these little buildings give them a safe place away from the winds and the scorching sun. After a day of wind and sand between my teeth I find an orange orchard where I secretly put my tent. A fox comes out and welcomes me before I fall into a deep sleep. I have to make up for the missed kilometers during the sandstorm. Walking in the base of the river is exciting but hard. Next to the river is a stretch of pure black asphalt. About 25 kilometers. I decide to get to the road but all things are not so easy. Kilometers through the sand and boulders of the river. I try the banks, but there is a lot of agriculture going on and I find myself trying to navigate trough dry farmers fields. There are no paths, just straight on through the brown, dried up fields. Slowly but surly my surrounding gets more green. A palm tree pops up, thorn bushes make way for lemon green grass and flowering weeds. Finally after a hot morning I get to the little oasis of the town of Arazene. I’m hungry and could use some good food. Just a minute after walking into the village, I ask the first person I come across where one can get some food. He guides me to his friends, and within a hour a beautiful tagine is produced and we eat while trying to communicate in French, Arabic and English. With my stomach full I forget to buy food for the evening and next morning, until I decide to set up camp in a field full of pumpkins. I don’t think they’ll miss one or two. When I hit the black asphalt next morning I know its going to be 25 kilometers straight on. Just a couple of curves, no lefts, no rights. Just straight on. You can find my Facebookpage here! “Shut up, be quiet!” Mustafa, our taxi driver is sweating. And very angry at us. He turns the car in the middle of traffic while he screams: “I bring you back to busstation, no cheap hotel for you!” He, what happend? Let’s go back 10 minutes. Leaving the bus in Agadir, where the Sous river flows into the Atlantic, Eveline and me get out. I met her in Marrakech and in search of her own adventure she decided to join me to Agadir. Like lost children we are an easy prey for taxi drivers who want to earn a quick buck from tourists. All of a sudden there is Mustafa with his battered taxi. Small mustache under big eyebrows and a sweaty forhead. A friend of him has a cheap hotel and he wants to bring us there. “Only tourist, good hotel!” This slogan comes out of the Lonely Planet of tourist scams but oke, lets go for it. We decide we pay him 50 Dirham for the trip. Like a stock car racer he is driving through the streets. Then he decides we have to pay 100 Dirham in stead of 50. When I object we get into a fight. He starts screaming and threathens to bring us back to the busstion. The car is already on it’s way back as a matter of fact. After some screaming we let him win the game. 100 Dirham. Sweaty taxi driver 1 – tourists 0. Is this Morocco? After a day in Agadir it’s time to start my journey. The end of the river is not easy found but around noon I finally got to the beach. I can’t get through the water and mud so I decide that 100 meters from the ocean must do. While I start walking a flock of pink flamingos fly over my head. I try to follow the river as close as possible, but soon this seems impossible. I have to walk through villages and towns on asfalt and gravel. 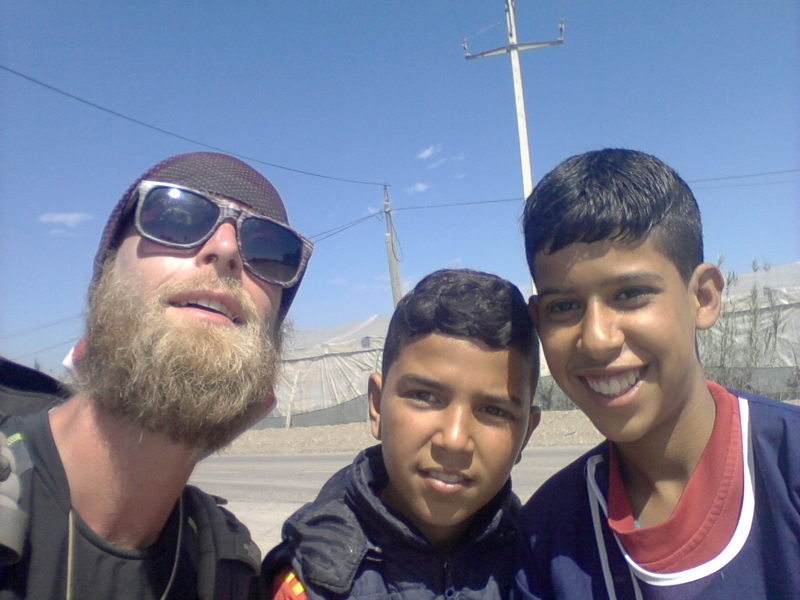 I find myself in outskirts where children ask for money. A youngster tries to take one of my walking sticks because he can use it. Children throw rocks. I walk fast and try to get out of this “civilised” area. But I understand it, my wealth is in no comperisement to their poorness. I don’t think I’m rich by western standarts but here the inside of my bag is way more then a month of earnings. My name is no longer Ali Baba like in Marrakech, but mister Dihram. Next day I walk into the countryside. People laugh more. They greet me and stick their thumbs up. We exchange smiles and everything becomes more positive. When entering a village most of the kids are quickly gathered around me and we shake hands, give hi fives and I let them listen to my electro music from my mp3-player. The countryside is filled with curious sheepherders, working people on orange fields and chilling people. These people seem happier then in the big cities where hussling is a way of life and making money. The way of life on the countryside is probably not too easy, but I could see it’s more rewarding. Trying to follow rhe river is a quest. Mostly I get close by and find myself going through meadows of chillis, melons or eggplants. The river is a little canyon in the landscape but after 30 kilometers nearly dry. Sometimes there is a puddle of water where birds gather. In the night I pitch my tent while bullfrogs sing as the mosques sing their prayers. Sometimes a lonely dog howls along. I almost feel the urge to howl as well. As an alternative to the riverbank I walk the little roads through the fields as close to the river as possible. Sometimes I find my own paths and the going is slow. Sometimes I choose asfalt and I can make up for the time wandering the fields. Most of the houses I come across are made of clay with hay or concrete bricks. No windows. There is no need for this, since it’s nearly always hot here. Early march is not too warm. I’ve seen people with woolen hats and thick jackets. 25 degrees is not warm. Summer is warm. I’m glad I’m not here in summer. The “heat” makes it harder to walk, especially in the fields there is hardly any shade and after a hour of walking I need to rest and air my feet. Blisters start to grow after day one and are a continious source of worries. Especially on my left foot where they have a foursome on an area of one centimeter. All I can do is air my feet regulair and in the process eat what I gathered in the villages. The stores in the villages sell bread and sardines. Fruit and veggies are bought on local souks. Which I don’t pass. Bread and sardines it is. Breakfast, lunch and dinner. One morning I walked into a village to turn up to the litte shop of Mustapha to gather some supplies (read: sardines and bread). I told him what I was doing and he invited me for tea in this house. Soon a table was set and bread, oil, honey and oranges where brought by his wife and daughter. In the traditional Moroccon manner tea was poured from nearly a meter high with fine precision. The feast could begin; this is real Morocco. After a day of rest and blister healing I continue to follow the Sous. 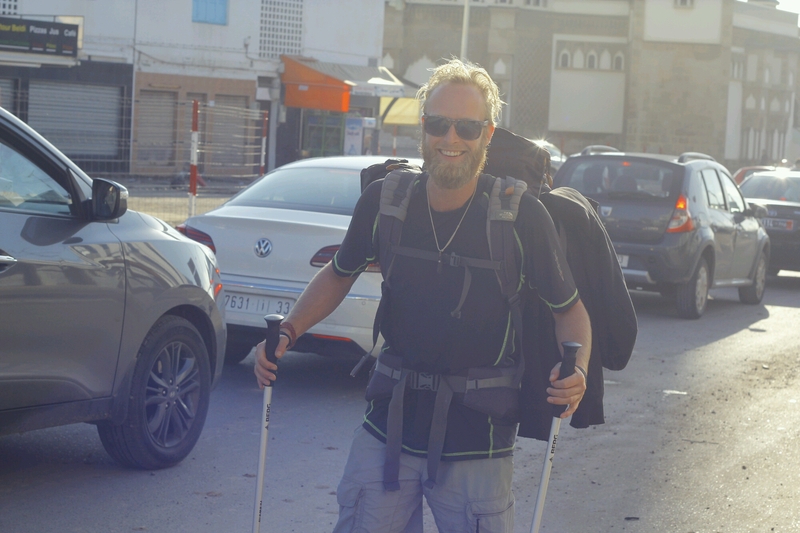 100 kilometers are left before I head North and head into the ice capped mountains of the High Atlas. The next stretch are mainly banana fields or a long asfalt road. Let’s see what happens!